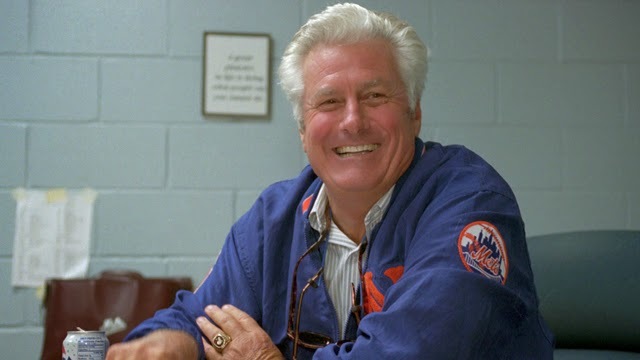 August 26th, 1996: On this day the Mets VP Joe McIlvane fired Mets manager; the 62 year old Dallas Green. Quotes: Joe McIlvane: ''We haven't done as well as we anticipated. Progress has been slower than expected. Our hope with this change is the younger players will begin to blossom some more, to come up to that major league level, to begin to make more significant contributions." 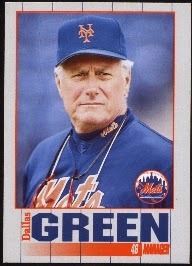 Green had taken over as manager of the New York Mets, in May 1993 replacing Jeff Torborg who had taken the club to a 13-25 record. When Green took over the Mets went 46-78 the rest of the way finishing in last place. In the strike shortened 1994 season, the Mets finished third (55-58) in the newly aligned division. In 1995 they finished below .500 once again (69-75) but did end up in second place. In 1996 the club was in fourth place (59-72) at the time of Dallas Green's firing. Green, the oldest manager in the NL at the time, was an harsh old school type of manager who was labled as having with no patience for young players. He criticized young Mets "Generation K" pitchers Jason Isringhausen & Paul Wilson publicly saying he didn't feel they even belonged in the major leagues. This was looked at by the players & organization as a betrayal to the team. Green had been in baseball for over forty years, starting out with the Philadelphia Phillies as a pitcher. He would manage the Phils (1979-1981) taking them to their first World Series title in 1980. He served as the clubs GM after that & then did one year as manager of the A.L. New York club. 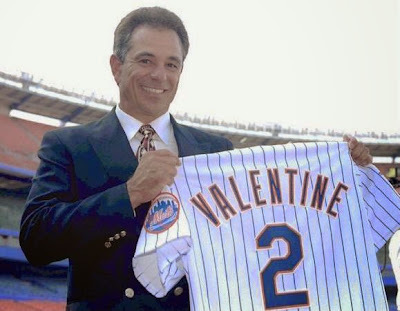 The Mets hired Bobby Valentine as the new manager ushering in the "Bobby V" Era. Valentine would be the teams fifth manager in the past seven seasons. The Valentine era would certainly be a successful, as the club went to two straight post seasons for the first & only time in team history in 199 & 2000. Valentine brought the Mets to their first World Series since 1986 & the first New York Subway World Series since 1956. He also took the club to it's first Wild Card title as well. 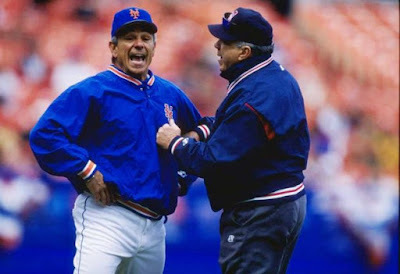 On this date the Mets also promoted Bob Apodaca to pitching coach. Apodaca had pitched for the Mets in the 1970's but had a bright career ruined by arm troubles. He had been pitching coach at AAA Norfolk under Manager Bobby Valentine.